Beginning January 1, 2019, more adults in Virginia will have access to quality, low cost health insurance. 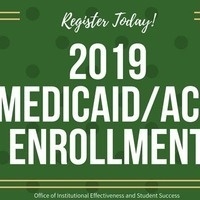 All NOVA students, their families, and eligible NOVA employees are welcome to join us for a series of enrollment-workshops where we will help eligible persons apply for insurance through Medicaid or the Health Care Marketplace in partnership with INOVA and Young Invincibles. Registration required, spaces are limited!